Bart Spices of Bristol, England, is Britain's largest independent producer of conventional, biodynamic, organic and Fair Trade herbs, spices, and many speciality food products. This is an independent, sustainable and management-owned business, sourcing its ingredients from all over the globe - including Organic wild seaweeds from Seagreens®. Strong environmental and community policies aim to reduce as far as possible its environmental impact. Trade spice to the supermarkets, and has recently become a member of the Organic Trade Board. Managing Director, Edward Shaw, has developed the business significantly since orchestrating a successful management buy-out, and a number of acquisitions in recent years have added brands like Hanbury, Veeraswamy and Blue Elephant to the Bart family. 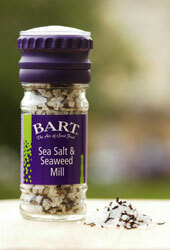 Bart's first Brand Partner product was a Salt & Seaweed mixture containing Seagreens® Certified wild Pelvetia. It won a West of England Gold Taste Award in 2004 and remains a best seller in all the best supermarkets and independent natural food stores. A further successful own brand product was developed in 2008 with Waitrose for their 'Cook's Ingredient' range, containing over 30% Seagreens® Certified wild Ascophyllum granules.